Ptolemy (The 'p' is silent - so it is pronounced 'Tolemy') is believed to have lived 127 - 145AD in Alexandria Egypt which was at that time part of the Roman Empire. 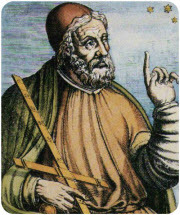 He was a mathematician, astronomer and geographer, and was one of the early believers that the Earth was at the center of the universe and all other celestial objects rotated around it. Hence this system is often called the "Ptolemaic" system. The system required many convoluted theories to explain the motions observed of the stars and planets. His great work was a set of 13 books called the Almagest, in which he puts forth his astronomical theories, but also much original work in mathematics and geometry. In mathematics he devised many new theorems and proofs, many of which are in another book of his called "Analemma". This book introduces much new thinking on three-dimensional mathematics, including the the projection from spherical coordinates on to three planes. He also addressed stereographic projections so as to represent three dimensions shapes on a single plane.